Hello and Happy Tuesday! Hope you've had an awesome week! It's been so beautiful here in Middle Tennessee! We had 70 degree weather over this past weekend! How gorgeous it was! 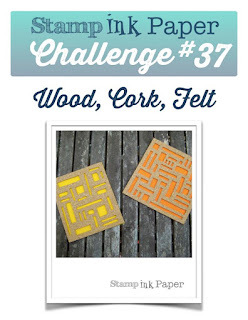 Today we have such a fun challenge over at Stamp, Ink, Paper and I know you'll want to grab some wood, cork, or felt and play along! I just received some of the awesome wooden "Expressions Natural Elements" from Stampin' Up! so I decided to use those for a fun birthday card for my son's girlfriend, Kaci! 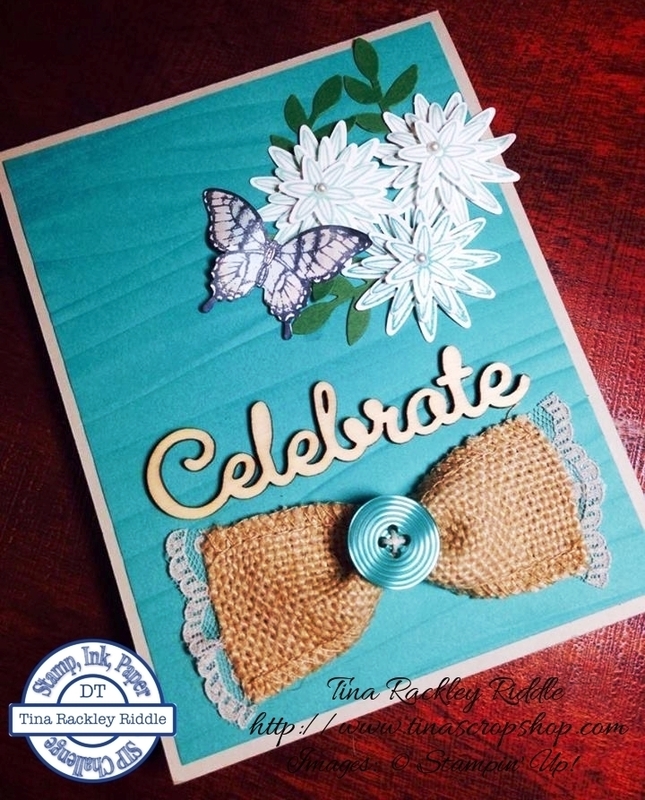 The "Celebrate" wooden element was attached with Beacon 3 in 1 glue onto my embossed layer. I added a bow that I made from a strip of Burlap Ribbon that was tied in the center with jute thread that had been first threaded through a Bermuda Bay button. I adhered some Sahara Sand lace trim on the ends of the burlap with more of the Beacon 3 in 1 glue. 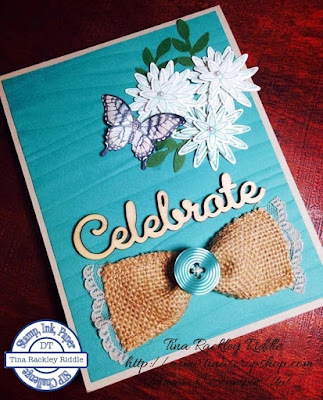 I attached the bow to the bottom of my card under the "Celebrate" sentiment with dimensionals. My flowers from the Grateful Bunch stamp set were stamped in Bermuda Bay and Pool Party and punched with the coordinating punch and then layered with dimensionals. I added a few leaves punched out with in Mossy Meadow Cardstock with the Bird Builder Punch. and tucked them under the flowers. I stamped the butterfly from the Papillion Potpourri stamp set in Memento Ink onto Whisper White Cardstock. I used my aqua painters to paint in some Pool Party and Crumb Cake ink and then punched out the butterfly with the Elegant Butterfly Punch. I used a bone folder to curve the wings and then adhered it with glue dots. 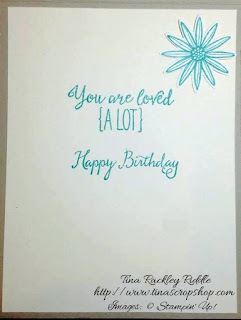 The inside sentiment was stamped in Bermuda Bay Ink. The "You are loved (A LOT)" sentiment is from the Grateful Bunch and the "Happy Birthday" sentiment is from the Balloon Celebration Stamp Set. I really liked the cursive font on both of these and felt they looked great together! Thanks so much for stopping in. 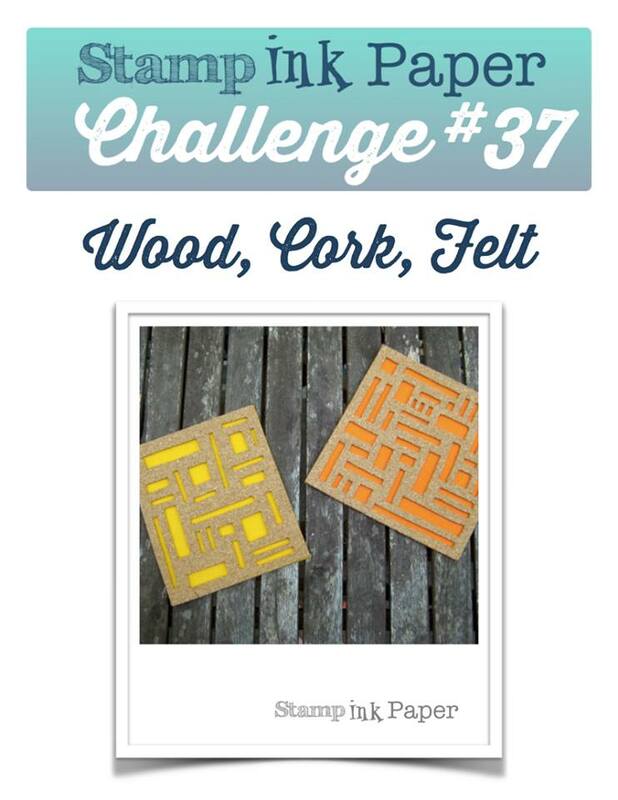 I hope you'll head over to Stamp, Ink, Paper and link up your own card using wood, cork, or felt!